To understand more about why your print solution matters so much in the era of the cloud, you first need to learn more about print management software in the first place. Print management software, often referred to as PMS for short, is actually a very particular type of enterprise software that has been around for over 25 years. For years, your print management software has essentially acted as “the brains of the operation” in terms of your business’ ability to print. 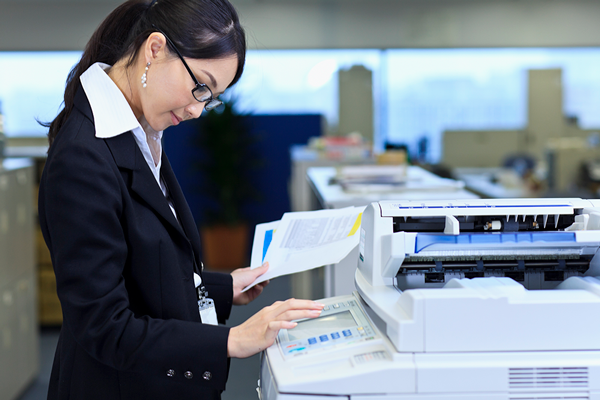 Even though all of your printers are connected to the same internal network, there still needs to be something of a “middle man” in play whenever an employee hits “print” on that next important document. Print management software IS that “middle man,” more or less. It’s a tool that lets a business centralize the administration of all connected printers and thus lower the overall cost of printing by providing the tools needed to monitor, control and maintain those printers from a single graphical user interface. It’s about more than just being able to print in general. An effective print management solution lets you reliably print the exact type of document you need, where you need it, WHEN you need it, every single time, no exceptions. But what happens when your software and your printers are no longer on the same network? Unfortunately, your print management software literally doesn’t know what to do because your business just rebuilt its entire physical network infrastructure to work with cloud-based applications. A piece of software has been moved to the cloud but your printer hasn’t – and sadly your problems are only beginning. This is one of the major – and immediate – changes that happens when you move your infrastructure over to the cloud. It’s also one of the major hurdles you will have to overcome in terms of effective print management in the 21st century. One of the major issues with these legacy print management solutions is that they’re not really built with the cloud in mind – if they have any cloud support at all, it was likely added in as something of an afterthought. Think about it like this: the major benefit of cloud computing in general is that everything is available from anywhere, at any location, at any time. This includes the ability of you and your employees to print – or at least, that’s the way it’s supposed to work. Many legacy print management software releases still have on premise infrastructure dependencies, which is one of the things that the cloud was supposed to eliminate entirely. Not only that, but they often can’t support cloud-based user authentication – which means that someone trying to print in the office may be able to do so just fine, but someone trying to print from a client’s office or even from the comfort of their own home when the office is closed on a snow day won’t be able to. They can’t be deployed on-premise first and then easily moved to the cloud environment of your choice WITHOUT requiring massive changes to either your software or to the infrastructure itself. They lack support for features you need like remote printing, mobile printing, pull printing and even desktop printing from the cloud. Users cannot enjoy the same services, submission methods or even the same user experience if they shift from on premise to the cloud and back again. Most legacy solutions can’t run on ANY cloud platform – at least without any on premise print infrastructure dependencies. Deployment in any third party cloud (like Azure or Amazon Web Services) is difficult, if not downright impossible. You still need to jump through a number of additional hoops, including the use of third party services for additional security like virtual private networks. So in an era where your shift to the cloud is supposed to bring with it an unparalleled new age of flexibility, productivity and efficiency, what about ANY of this sounds flexible, productive or efficient? But thankfully, there IS a better way to print in the era of the cloud. It just requires a subtle-yet-important shift in your own perspective. So with all that in mind, the key to truly unlocking all of the benefits that the cloud is supposed to bring with it has nothing to do with finding the right print management solution for the modern era. Instead, it’s about leaving print management software behind in favor of a much better, brighter and more productive future. This, in essence, is what we do at PrinterOn – we’re proud to offer the broadest and deepest secure cloud printing solutions for enterprises available today that are designed to work with the cloud, third-party cloud services, on-premise deployment and even all of the above at the exact same time. Each edition of PrinterOn Enterprise features not only secure print and release, but also support for PrinterOn’s robust array of mobile apps for both the iOS and Android platforms. So you get a lot more than just efficient print management capabilities. You get email printing, web printing, true mobile printing, native iOS printing, remote printing and much, much more. So from that perspective, this isn’t a conversation about how to find a print management solution that supports your new cloud-based environment at all. Instead, it’s about finding a printing solution that is every bit as innovative and agile as the cloud is in the first place. It’s not about trying to increase compatibility with the cloud, but instead about using the cloud to allow you and your employees to print anywhere – no questions asked. The fact of the matter is that they don’t have to – at least, not anymore. Cloud computing absolutely brings with it a wide range of different benefits that you won’t be able to find anywhere else, but it also brings about its fair share of considerations, too – particularly when it comes to print management software. Yes, these types of print management solutions have existed for decades. Yes, you and your employees are probably using one right now. But many of those “old school” solutions are exactly that – clunky, proprietary, slow to change and, well, old. Moving into the cloud WITHOUT also embracing modern printer solutions like those offered from PrinterOn will essentially eliminate all of the benefits you were supposed to be gaining from such a shift in the first place. If you’d like to find out more information about what our PrinterOn Enterprise software can do for you in the era of the cloud, or if you have any additional questions that you’d like to see answered, please don’t delay – contact PrinterOn today.